I love this watch. It is easy to use at a fair price. I hate wearing watches. This product clips easily to one of my belt loops. I can wear it with any clothing, casual or professional. The battery lasts longer than one year and Is easily replaceable. 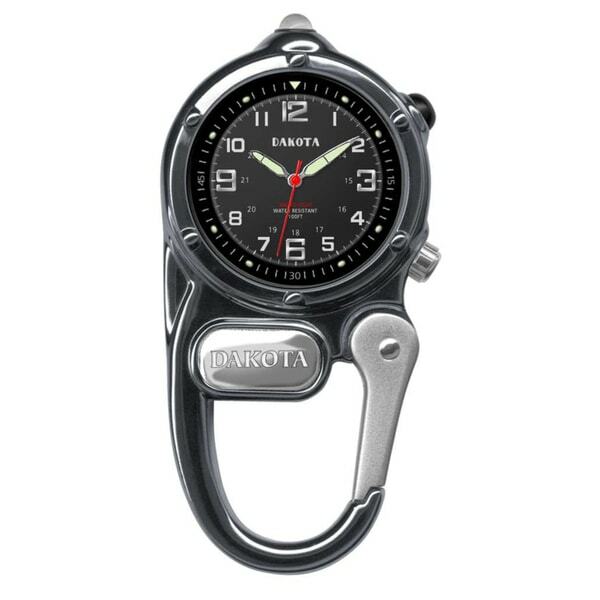 Always have the time close at hand with the mini clip microlight by Dakota. Stylish and practical, the alloy and stainless steel constructed mini clip features an integrated carabiner clip for convenient use and a red LED microlight. Perfect for clipping to belts, purses, golf bags, you name it. I attach this to the d-ring on my saddle and I have a handy watch for riding! It's perfect! Great product light weight great light that can be used for anyjob! It is easy and fun to use. I do not like wearing a watch on my wrist. I can clip this watch to my belt loop. It is fashionable, sturdy, and reasonably priced. I love using it. It so easy to see the time whenever I need it. The battery lasts for more than one year and is replaceable.